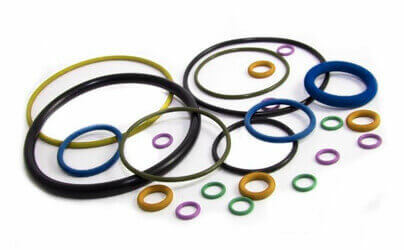 Hydrogenated Nitrile Butadiene Rubber (HNBR), as the name suggests it is a hydrogenated version of NBR, It has better physical strength and retention properties to chemicals, heat & oil as compared to NBR. Properties : HNBR has better resistance to oil, gases & steam as compared to NBR, and also has less degradation over longer period in harsh temperature environments, Also this polymer can provide very good tensile strength depending on loading and filler selections. Not Compatible : Ketones, Esters & Ethers, Chlorinated Hydrocarbons & Strong Acids. Chemical Resistance : Weathering, Ozone, Water, Salt Solutions, Diluted Acids, Vegetable Oils & Aliphatic Hydrocarbons.